What are the free demo restrictions for Tune Sweeper? What are the Tune Sweeper free demo restrictions? 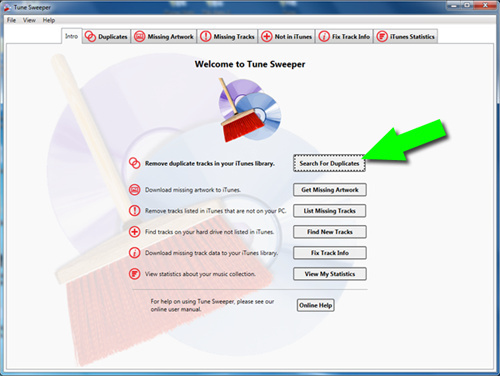 The free demo version of Tune Sweeper allows you to access the software with limited functionality. This will enable you to evaluate whether Tune Sweeper will meet your requirements before committing to a purchase. The full range of features and free updates are available in the full version of the software. What can and can't you do with the demo version? The demo version of Tune Sweeper will search through your iTunes library and find and display duplicates in iTunes. The full version of Tune Sweeper	is required to remove duplicates. The free demo version of Tune Sweeper will go through your iTunes library, show any songs that have missing artwork, and will show you the correct covers for each song. To update your iTunes library with the new relevant artwork, you will require a full version of Tune Sweeper. The demo version of Tune Sweeper will show you all the missing tracks in your iTunes library. Missing tracks are tracks which will not play in iTunes, as these tracks are listed in iTunes but their file on your hard drive is missing. Missing tracks are marked with an exclamation point in iTunes. A full version of Tune Sweeper is required to remove Missing Tracks from iTunes. As the opposite of Missing Tracks, the demo version will highlight any tracks that are on your hard drive, but aren't added to your iTunes library. A full version of Tune Sweeper is needed to add these tracks to your iTunes library . The demo version of Tune Sweeper allows you to download information so you can see what tracks in your iTunes library have either missing information or incorrect information about the track. To save the updated track info to your iTunes library a full version of Tune Sweeper is required. The demo version of Tune Sweeper will show you all the songs in your iTunes music library that are part of your Apple Music subscription. The Apple Music feature is not restricted in the free demo. The free demo version of Tune Sweeper allows you to look at your iTunes statistics. This feature shows you your most listened to artists, top genres, track count and gives you the ability to find out more about your favorite artists. You can also share your statistics with friends on Facebook. The iTunes Statistics feature is not restricted for the free demo.